Well, it's been a while since my last post. I have had the dreaded flu and have really not felt well enough to post anything. I have had an ear infection which made me dizzy and deaf and extremely prone to falling over when getting up too quickly or bending down, or pretty much just walking around, I have had a sinus infection which was just too gruesome to mention and I have been battling high temperatures, aching muscles and a horrible cough but I am happy to say, 6 weeks later I am finally feeling much better ...... and let me tell you I am so happy to be feeling almost human again. I missed 3 weeks at the market and watched so much daytime TV that I found myself actually starting to like some of it .......eeeek! But happily, I'm now back. I'm back at the market, I'm back sewing and baking focaccia and have even added gluten free focaccia to my repertoire and I am finally back blogging again. While I was ill I also had time to think a few things through. Until now, the market, although fabulous fun and great place to be, is not really financially viable enough to provide me with enough money to live on and although at the moment that's fine, in a few years time this is not going to be the case. So, I am in the process of coming up with a 4 year plan to make sure that I can grow my business enough to provide me with a modest living when the time comes. Now, don't get me wrong, I'm not expecting to become a millionaire, nor am I even expecting to be particularly well off but I am hoping to at least be able to support myself. I don't live a particularly lavish lifestyle and I try to make the most of what I have by making do, upcycling things like furniture and fabrics and making my own soft furnishings so, add to that growing my own veg, keeping chickens for eggs and being thrifty in the kitchen and I am hopeful that I will see my 4 year plan pay off. It was with this plan in mind that this week, I made a massive decision. My handmade focaccia is really taking off at the market and last week, I was asked if I could make some gluten free focaccia as well. After much testing of different recipes and sourcing of all the ingredients, my 3rd batch turned out extremely well. The only problem is, whereas normal focaccia dough is like wrestling with an uncooperative jelly fish, gluten free focaccia dough doesn't need kneading at all, just whisking. In my case, this meant whisking with a hand-held electric whisk. No problem you might think, easier than kneading a jellyfish, you might think but honestly ...... when is life ever that simple! Gluten free focaccia dough is like very gloopy, thick, sticky cake batter. It sticks to the beaters and climbs it's way up them, trying to climb inside the mixer and jam up the motor and when you lift the beaters out of the dough to scrape them off, it sprays it all over the kitchen walls! Not good. 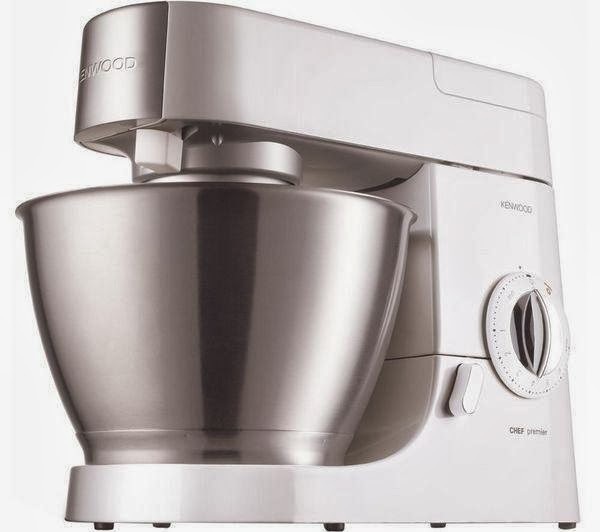 I bought a food mixer! A very expensive food mixer!! I felt faint after I had ordered it and had to sit down and have a cup of tea. I then had to stop myself ringing and cancelling the order after I got cold feet and freaked out about how much it cost. And, despite the fact that I was freaked out about how much it cost I think it will be a great investment and I really can't wait to use it. So I am now sitting on the sofa waiting for the knock on the door like a kid waiting for Santa Clause. And if anyone has any advice on how to make my fledgling business more profitable, with marketing, promotion, how to grow the business, things like that, I would be immensely grateful. I'm glad you are feeling better it sounds like you have had an awful time of it. Mike bought me some top notch kitchen appliance quite a few years back. I've never had to replace them so I think you do need to spend extra money for the quality. You have had a terrible time of it havent you? Flu is horrible isnt it? You feel so poorly for the couple of weeks you have it and then it takes a few weeks for a full recovery.Hopefully you are back to fighting fitness again. Loving the food mixer and as you say expensive, but it will be an investment. I bought a Kitchenaid mixer last year and use it every week.I love it. So good to see you back, Kay; I've really missed your blog. What a rotten time you've been having - hopefully that's your quota of illness for 2014 and you will be fighting fit for the rest of the year. As your lovely bread sells out pretty quickly, how about an eye-catching poster/board on your stall indicating all the varieties you make with an invitation to order whatever is required for the following week? The latecomers never see the range of goodies, so maybe photos to show them?